ISBN 9781 74283 007 0. You all know the tune for our Australian Anthem, well this tune is the same. Only you haven’t heard these lyrics before! Written and sung by well known singer/songwriter Colin Buchanan and illustrated beautifully by Simon Swingler, this book is a Christmas must have. 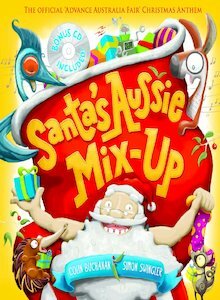 Santa’s Aussie Mix-Up is a great story/song about what happens when Santa let’s a bunch of Australian animals help him out. The results of which are funny, messy and colourfully, chaotic. Stick this one in their stockings folks! Pingback: Bloody Santa. And I mean BLOODY Santa. « Lunki and Sika – Movie, TV, Celebrity and Entertainment News. And Other Silliness.